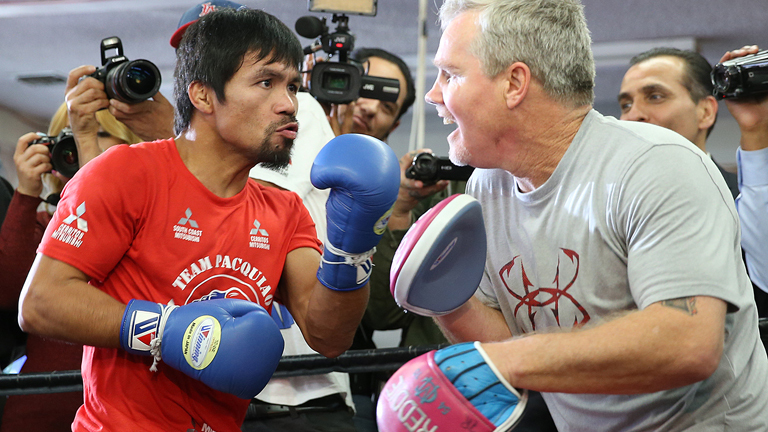 Freddie Roach says there is no deal for him to reunite with Manny Pacquiao: If he can't call me, there is no deal! Filipino boxing legend Manny Pacquiao said Monday before a press conference in Manhattan that longtime trainer Freddie Roach would return to his corner for his upcoming Jan. 19 fight against Adrien Broner in Las Vegas. However, that does not appear to be the case any longer, as Roach himself expressed bewilderment at the news. "I still have never directly spoken to Manny (since the 2017 loss to Jeff Horn)," Roach said. Pacquiao reiterated on Tuesday that lifelong friend and associate Buboy Fernandez would continue his role as head trainer, but also added that he hoped Roach would return in a supervisory role. "Freddie can supervise or instruct Buboy; this is what we're going to do." Pacquiao also admitted that there has been no communication between himself and his former trainer. Although their partnership had lasted for more than a decade, with Roach helping transform Pacquiao from a one-dimensional left-hander into one of the most explosive boxers in the sport, "Pacman" cannot remember the last time he spoke to Roach, blaming the demands of his senatorial duties in the Philippines for the disconnect. Pacquiao, who has not fought in the United States for the last two years, is coming off a seventh-round knockout of Lucas Matthysse on July 15 in Kuala Lumpur, Malaysia. His last bout in the U.S. was in April 2016 against Timothy Bradley in a trilogy fight. Pacquiao dropped Bradley twice en-route to a unanimous decision victory.